Been busy this last week and weekend with artwork. Unfortunately, I can't share most of it yet (covers for upcoming Mouse Guard issues, the hardcover and the RPG) But I can start to share some sketches I'm doing for an upcoming Children's book with Harper Collins called Snowy Valentines Day. It's based on the story I drew for Julia as a gift on our first married Valentines Day. The story is being tweaked and added to so that it can be a full length picture book. The editors over at Harper Collins are fan of my Wind in the Willows illustrations and we decided to try and capture that style for the look of this book. 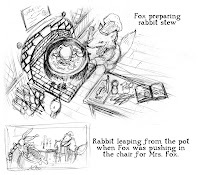 The new version include several friends the main character (now a rabbit) asks for help in finding the perfect gift for his bride. 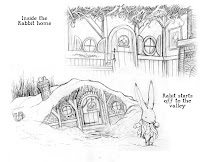 I have been having fun coming up with looks for the different critters homes and furnishings in fact the Rabbit's home has a few details of items that can be found in our real home. Absolutely beautiful work as usual. I love the mice but I hope there are more "races" in this world you've created. When will we see some of your weasel artwork?